You seem like a man with amazing ambition and incredible leadership skills! You know who else was like that? Just about every great ruler in the history of the world. One of the most notable leaders is Julius Caesar, the ruler of the Roman Empire. 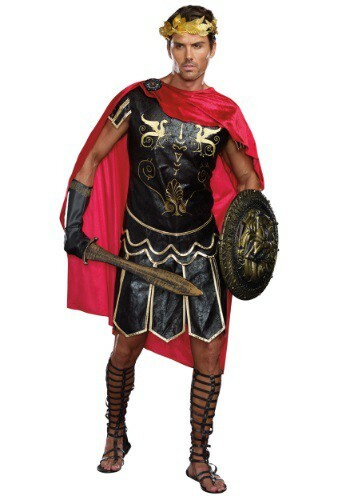 Now you can aspire to be just like Caesar this Halloween with this awesome men’s Julius Caesar Costume! You’ll look royal enough to lead a nation and mighty enough to storm a battlefield once you toss on this kingly attire. It’s the combination of the blood-red cape and the golden leaf headband. Those two included accessories really bring this costume to the next level. You may not know a darn thing about politics but while you’re wearing this guise, people will be running up to you, left and right, seeking your imperial wisdom. Don’t worry about studying up on ancient Roman laws and decrees because with this emperor’s costume whatever you say will go. Now the Roman Empire was constantly grown for decades, even centuries. How you ask? By taking land and claiming as their own! So you need to look battle-ready at all times so you can be sure to procure your spot on the dance floor as well as in any party games. You’ll want to take a look at the Roman weaponry we have available. Grab and sword and a shield or a mighty battle axe and you’ll be ready to cease control over any party that you grace with your presence this Halloween!